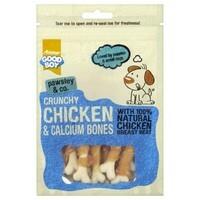 Good Boy Pawsley & Co Crunchy Chicken & Calcium Bones are 100% natural treats with additional calcium to offer your dog a healthy alternative as part of a balanced diet. Made with 55% chicken and free from artificial colourings and preservatives these tasty chicken flavoured treats and particularly good for growing puppy's, as the added calcium is beneficial in supporting healthy bone and teeth development. These mouth-watering treats are filled with goodness and work great as both rewards and training aids or just as a healthy treat.